The TLX is advertised as \"that kind of thrill\" with video of the car hugging curves, blasting down the road. How are (1) steering feedback, (2) body roll in curves, (3) engine power & transmission for the V6 and the i4. As an owner of a 2015 TLX V-6 I can say that it handles pretty good but not great. I prefered the handling of my '08 TL Type S much better and wish that Acura could have incorporated some more of that handling into the TLX. It's not the canyon burner the ads would have you believe but gets the job done. I had driven both the V-6 and I-4 and really like the V-6. It just gets up and goes when you put your foot into it. I suggest that you take both the V-6 and I-4 for an extended test ride on various roads. Not a 10 minute ride with the sales person and make up your mind which you prefer. I've had "issues" with the 9 speed trans and a couple of other problems which are documented in this forum. Guess I got the short straw on this car as my 3 other Acura's were "bullet proof". I have the v-6 with SHAWD. the engine is a gem. It is powerful and smooth with surprisingly good fuel economy. 29 mpg overall. The SHAWD system is tremendous. It allows the car to take turns much faster than you would think possible, because it applies more torque to the outside wheels in a turn. one downside - large turning radius. The transmission shifts slowly and roughly at low speeds. This is a known issue. I had a firmware update installed by Acura which improved it some, but not completely. The transmission is the weakest part of the car. The car handles well. It is a blend between a comfortable car and a sporty car. I think it is a good balance. Steering is accurate with some feedback. Visibility good. The car would handle better with different tires. Stereo on Advance model is outstanding. No reliability issues in first 25k miles. No squeaks rattles or interior wear. If you note the first two commenters, they both refer to transmission issues. 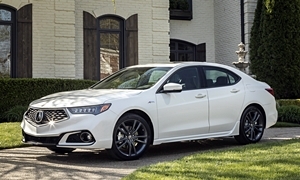 Just be aware as good as this car is, it has been widely reported by magazines such as Cousumer Reports that the first model year of the TLX with the V6 has had a lot of tranmission issues. Honda has a poor track record as of late launching new cars with new transmissions. When they went to a 5 speed transmission back in 2001 on the Acura TL (the car I owned), it had massive transmision problems and when mine failed after 60,000 miles I was in a rental for a month due to the backlog of failures (I was 8th in line to get a transmission). They just gave me a rebuilt transmission and warned me it would fail again at twice the mileage (it did). I also owned a first year 5 speed Honda Accord V6 transmission that died after 19,000 miles. So the first year can be pretty rough for Honda and their automatic transmissions on their new cars. Just be aware if the problems are not fixed when you buy yours, you could have the same issues many owners have at first with the new Honda models.